The information below is a brief summary of a book called “Twenty Five Years On – The History of 2nd Frimley (St. Peter’s) Scout Group”, compiled by Bridget J. Goron, and printed in about 1990. A link to a scan of the entire book is at the bottom of this page. The 2nd Frimley (St Peter’s) Scout Group began in 1965. The 1st Frimley Scout Group had started in the late 1930s, and continues as a successful group operating from its headquarters in Longmeadow. However, in the 1960s it had very long waiting lists, caused by the rapid expansion of Frimley. A group of parents in the Sheridan Road area, whose sons were being denied the opportunity to gain any scouting experience, therefore joined together to form a new Cub pack. This was the beginning of 2nd Frimley. 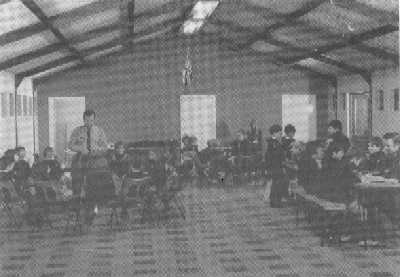 The new group, called “2nd Frimley (St. Peter’s)”, was sponsored by St. Peter’s Church, and was initially to meet in the church hall. 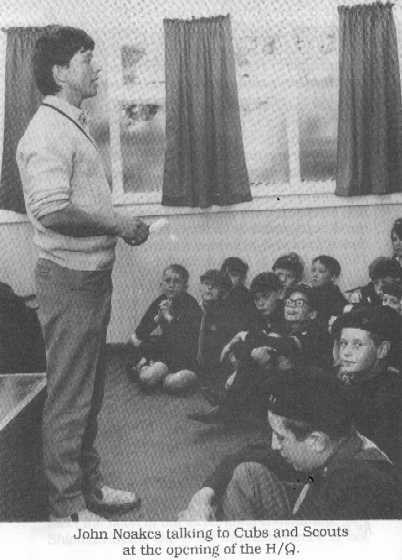 The Cub pack held its first meeting in November 1965, with ten boys, and plans were made to start a Scout section. In January 1966 all ten novice Cubs were enrolled into the Scout movement, and in May 1966 the first meeting of the Scout Troop took place. A generous donation from Johnson Wax enabled the group to buy an army hut, and permission was granted for it to be erected on land behind St. Peters tennis courts. After months of hard work, it was assembled in early 1967, but it was only after the heating had been installed a year later that it was ready for meetings to be held in it. On 18 May 1968 it was officially opened, with John Noakes, the “Blue Peter” television programme presenter, as the “Guest of Honour”, but it was not until March 1969 that the toilets were installed, and March 1970 when the electricity was switched on. The 2nd Frimley headquarters was at last fully operational. The group expanded successfully, but on 17 June 1971 disaster struck. During the night, the hut caught fire, and was almost completely destroyed. 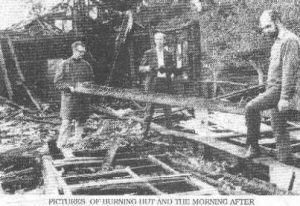 You can see here photos of the fire and of the remains of the hut. 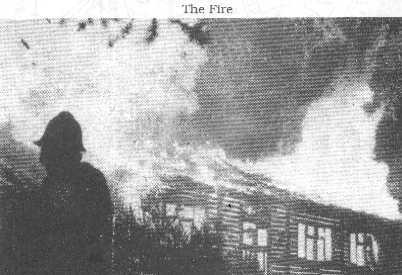 Fortunately, it was insured against fire, and the Grove School Parent-Teacher Association offered a portable building to use temporarily. After weeks of effort, the temporary hut was installed. There were delays in the construction of the new hut. However, following an agreement that the Girl Guides would be able to use the hut, the heating was installed with money raised by the guides, and by the end of 1972 the new building was ready. It was being used by two Cub packs, one Scout troop, one Brownie pack and two Guide companies. 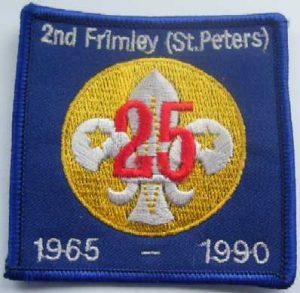 In 1982, following the continued expansion of Frimley, and of the 2nd Frimley group, there were 178 boys and “Scouters” in the group, and we were the second largest group in the whole of Surrey. By 1989, with the addition of two Beaver sections, the group had grown to 276 boys. A scan of the entire book, in pdf format, can be seen by clicking here, but please be aware that this is a large (5.6Mb) file, and will take a long time to appear if you have a slow internet connection.